CloudVO, the San Francisco-based online provider of virtual office space and meeting rooms that has set the agenda in the Workplace-as-a-Service ™ space since its inception in 2010, formally unveiled its new CloudVO.com portal, via a free webinar designed to help shared office space providers optimize their meeting room business in the fast growing on-demand meeting space market. 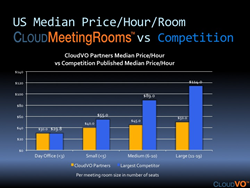 The webinar released a detailed pricing analysis of more than 3,000 meeting rooms in the United States, showing that hosting a professional meeting at a typical CloudVO meeting room can be 50% less expensive than doing so at equivalent competitors' locations. Cloud Meeting Rooms’ bookings can be made online at close to 500 selected locations. The demand for coworking, virtual office, and on-demand meeting room space has exploded the last few years due to the emergence of the freelance economy, mobility, and the consumerization of the workspace. Freelancers and companies of all sizes purchase virtual offices to establish a business identity at CloudVO locations and use coworking spaces, day offices, and meeting rooms to conduct off-site business in greater numbers than ever before. The new portal is designed for serviced office space providers and coworking operators to integrate their virtual office, coworking, and meeting room services into the CloudVO service offering. CloudVO typically resells local virtual offices and meeting rooms at the same price as its local partners on CloudVirtualOffice.com and CloudMeetingRooms.com, but can augment their offering with its own centralized services, including live phone answering, unified messaging, live chat, concierge services, call center, and support services. CloudVO also provides CloudTouchdown subscription cards to end-users with network-wide access to a growing network of close to 500 independent providers worldwide. To its workspace provider partners, CloudVO offers expanded marketing opportunities, rigorous screening, fraud watch capabilities, and preferential benefits to their members. To end-users, CloudVO provides on-demand access to virtual offices, meeting rooms, and coworking spaces available on a pay-per-use basis or on a subscription model, a label of quality, standardization of service offerings, and a professional service delivery throughout its network. CloudVO is the umbrella brand of Cloud Officing Corp, headquartered in San Francisco, California. CloudVO’s mission is to provide comprehensive virtual office and meeting room solutions to mobile workers and telecommuters under a Workplace-as-a-Service ™ model. CloudVO operates the CloudTouchdown network that grants preferential access to day offices and meeting rooms at close to 500 locations worldwide for distributed workers under a pay-per-need model.